Bruegel’s Two Monkeys painting is set in a sixteenth century Antwerp when there were perhaps no monkeys there. The monkeys could only be imagined in the unmistakable Antwerp landscape in the painting as if they were surrogates for the slaves bought from Africa. But make no bones about it , their freedom has been bought for a hazel nut .You can see the nut lying about with the broken shell left, in the painting. See the expressions on the monkey’s faces. One is understandably annoyed , the other in attitude of devil-may-care. Monkeys with expressions? Monkeys are our ancestors ,from whom we have inherited the human condition. We are descended from monkeys although we alone are responsible for the condition of our enslavement. 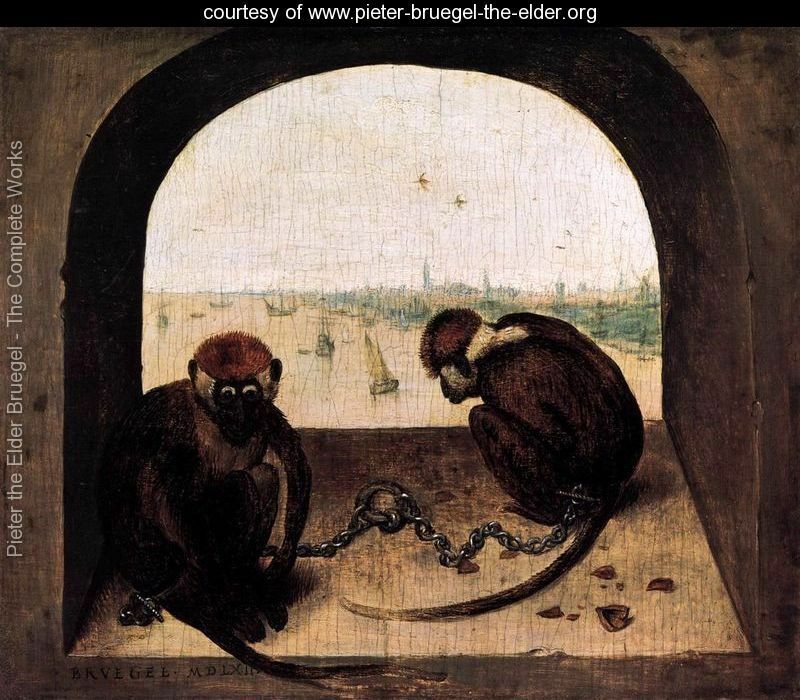 The monkeys sit chained to a window sill overlooking the Antwerp city. Their freedom has been bought for a hazel nut. Hark back to the old Netherlandish proverb : Go to court for a hazel nut. Who has bought their freedom for a hazelnut? Who went to the court for the nut? The monkeys have sold their freedom for a hazel nut? Permanent chains for a mere nut? Like Faust who would sell his soul for material riches. But going to the court for a hazel nut is a different context too. You would not only risk your freedom for the sake of a mere nut. You would spend all your resources fighting a court case for a nut. But in reality it is not the monkeys that have lost their freedom but the men behind their capture and chaining to the window-sill. It is the humans that go to the court for a hazel nut. Monkeys look at the hazel nut as mere nut but the conditioned mind of a human being looks at it as more than a hazel nut. Has the human bought the monkeys’ freedom for a hazel nut? No. He has merely stolen the freedom of the monkeys by offering an inducement of a hazel nut. Actually the freedom represented by the Antwerp city with its picturesque buildings and sailing ships means nothing to the monkeys for whom freedom is in the freewheeling forests of Africa. No doubt the chains represent the monkey’s loss of freedom but the painting’s contrast of the dungeon with the freedom outside means nothing to the monkeys. There is no pathos in the painting ,only a mockery at the absurdity of a human action in depriving the freedom of an animal to absolutely no purpose. The painter is merely laughing at the absurdity of human actions, when he juxtaposes the chains on the monkeys with the freedom represented by the outside landscape. If a human is cruel enough to deprive the monkey of its freedom represented by the Antwerp city,he shall derive no pleasure from the action. The animal does not know what it has been deprived of because the only freedom it knows is in the forests of Africa, so far away,so much removed from its present existence. The exam is the history of Mankind. The poet talks about the human condition, although the painting is about two monkeys. The monkeys are the stuff of the poet’s dreams about the history exam. She stutters and hedges but cannot understand the condition of the monkeys.It is not a history of monkeys.It is about mankind.One monkey stares and listens with a mocking disdain, the other is just dreaming away. That is how mankind’s history can be summed up-a story of man’s inhumanity to man, the enslavement of man by his fellow-man. The chains on the monkeys represent the suffering wrought by a callous disregard for the dignity of a fellow being. We are set, we grow, we turn to earth. As shadows wait upon the sun. The king vainly seeks to perpetuate his memory by conquering kingdoms .He collects trophies and dead things to leave his living name behind.An interesting juxtaposition of seeking to leave a living name with a collection of dead things,himself as dead as the ones in whose death he is instrumental. The king soon turns a dead thing himself but seeks to leave a living name behind. A vain ambition in the sense of a useless ambition to achieve immortality by the instrument of other people’s deaths. An extension of the image in the first line, where living flowers perfume our burying. Perfuming our burying is an evocative image .As we are buried our deeds are buried with us and only praises are sung in our obituary references and sweet smelling flowers are laid on our bodies before their burial. “And weave but nets to catch the wind” is another lovely image.The kings vainly try to gain immortality by making their name “living” after their deaths.This they do by a collection of trophies and other dead things they have secured in their lifetimes.Their names are just wind and cannot be captured to live eternally, a futile exercise like catching wind in a fish net. All their lives they have woven these nets for catching fame that will outlive them and make them immortal,a futile exercise.. A beautiful metaphor.